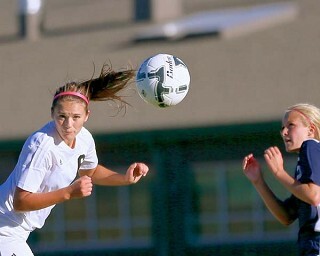 The Lady Outlaws kicked off league play with a 2-1 victory at home over Sutherlin on Thursday, September 15. Two days earlier it was a completely different story, with the Outlaws on the short side of the stick in a 7-1 loss at home to the Henley Hornets. Sisters was excited to record a win in their first league game of the season at home on Thursday against Sutherlin. It was a scoreless contest as teams headed into the half, but the Outlaws picked it up when they got back on the field. The Bulldogs scored 15 minutes into the half, and Sisters answered with a goal from the 18-yard mark from Nika Chick off a Rylee Weber assist. Chick knocked in the Outlaws final goal from the 15-yard mark in the 74th minute to secure the win. Sisters recorded 24 shots on goal, while Sutherlin only tallied 10. Sisters scored just five minutes into the contest, but then were held scoreless for the remainder of the game. The Outlaws’ lone goal came when Rylee Weber got fouled in the goal box. Nika Chick took the shot from the penalty kick line and scored. Henley answered with three goals to take a 3-1 lead at the half. The Hornets tacked on four more goals in the second half and recorded the win. Charlotte Barton played an amazing game for the Outlaws, and recorded over 20 saves in the box. Coach Pike noted Olivia Hougham’s outstanding play. Sisters was to play at Sweet Home on Tuesday, September 20. The Lady Outlaws will play at home against Elmira on Thursday, September 22.